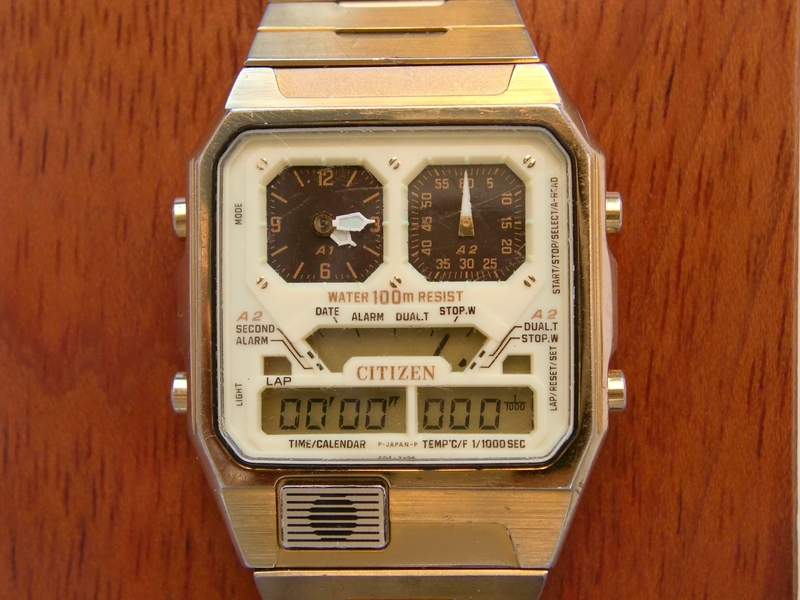 Push „M” button to set next Digital Watch Mode. 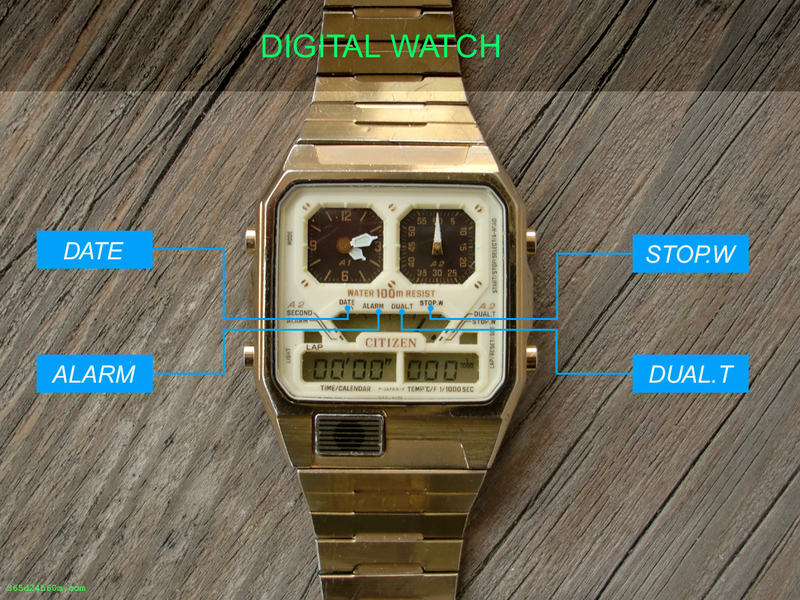 *Note – The digital modes can be set regardless of what is currently showing on the analog watch – How to use Analog Modes . ( The exception is Stopwatch Mode when both Digital & Analog Modes are related to each other… described below ). This is the only digital mode in which „modes indicator” is invisible ! You probably noticed that the Temperature Indicator ( *C or *F ) now is blinking once per second. This means that the measurement is made every One-Second !!! To change – the measurement being taken at One-Minute, press „R” button. * If you leave The Per-Second measurement Mode – this Mode will be Automatically Shifted to the Per-Minute measurement Mode in 4-5 minutes ! Picture below shows the measurement on a Celsius scale. If you want to change the measurement scale ( *C to *F or *F to *C ) simultaneous push „R” and „S” button to switch between Centigrade and Fahrenheit Thermometers. *Unfortunately no switching is possible between the centigrade and Fahrenheit thermometers witch Cal. No. 8981 ! The difference between the Celsius scale and the fahrenheit scale is described in detail on Adjusting Thermometer. I just changed the measurement scale from *C to *F . Picture below shows the measurement on a Fahrenheit scale ( 23,9 *C = 75,02 *F ). What is - storage of the tempheratures ? 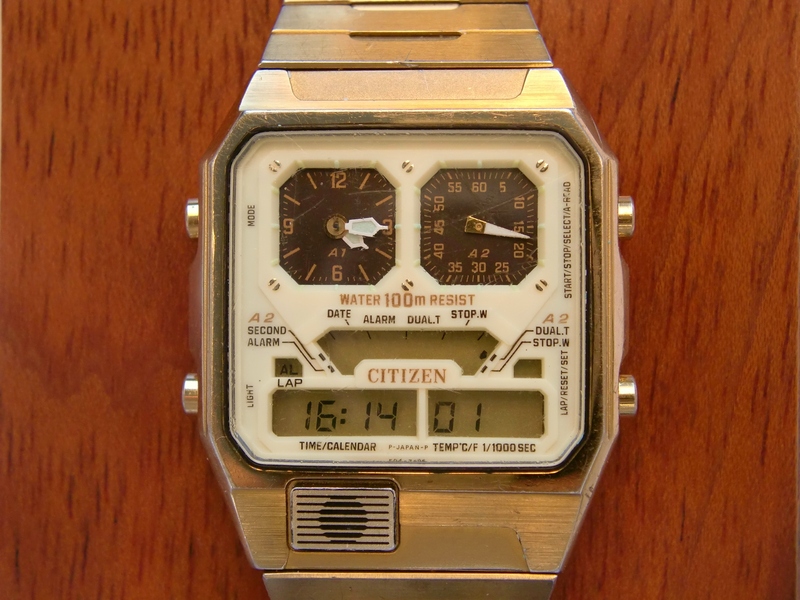 The Citizen Watch has a built-in memory and stores temperature measurement – made at time ( the same as setting Alarm time - How to set Alarm Time ). Even if you don’t use the alarm and you turn it off ! Click to enlarge…Built-in memory allows you to store daily temperature in Celsius or Fahrenheit scale ! 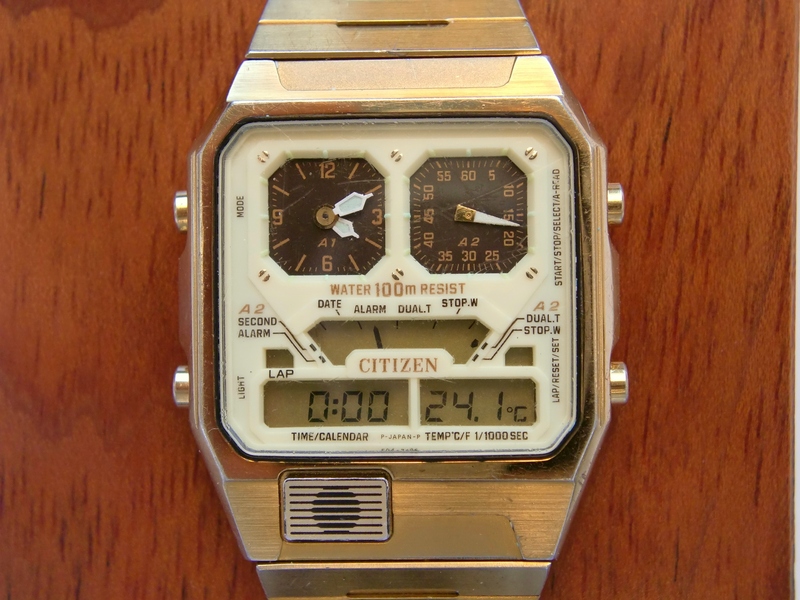 Regardless of whether you turn on your alarm or not, the watch measures the temperature every 24 hours, and stores it ! The measurement result is stored only 24 hours – to the next measurement . Old measurement is deleted and replaced by a new measurement. „Thus you can know the temperature at the same time every day or at a certain moment designated optionally” *Citizen’s words. Alarm ON/OFF – by pushing „R” button. Look – on the left side „AL” sign appeared ! 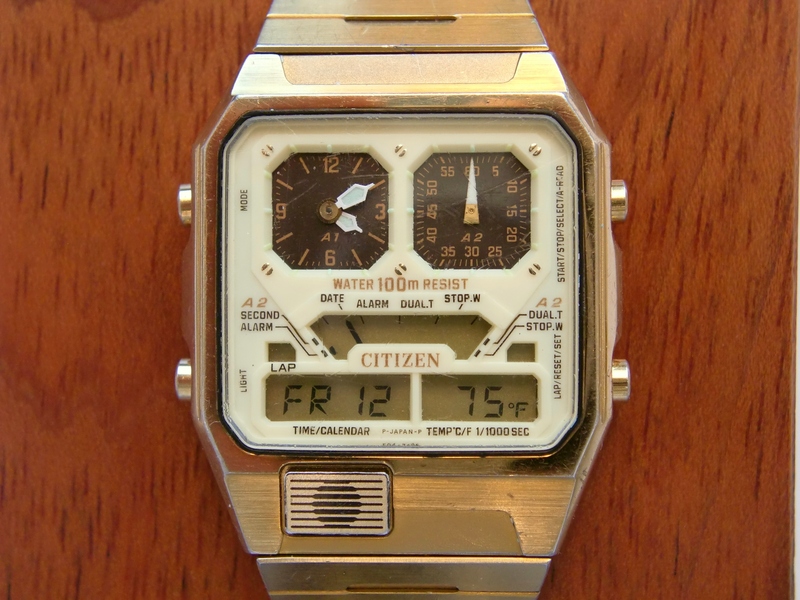 As you might see A1 ( First Analog Watch ) shows as usual The Normal Time ( i.e. Hours and Minutes ). 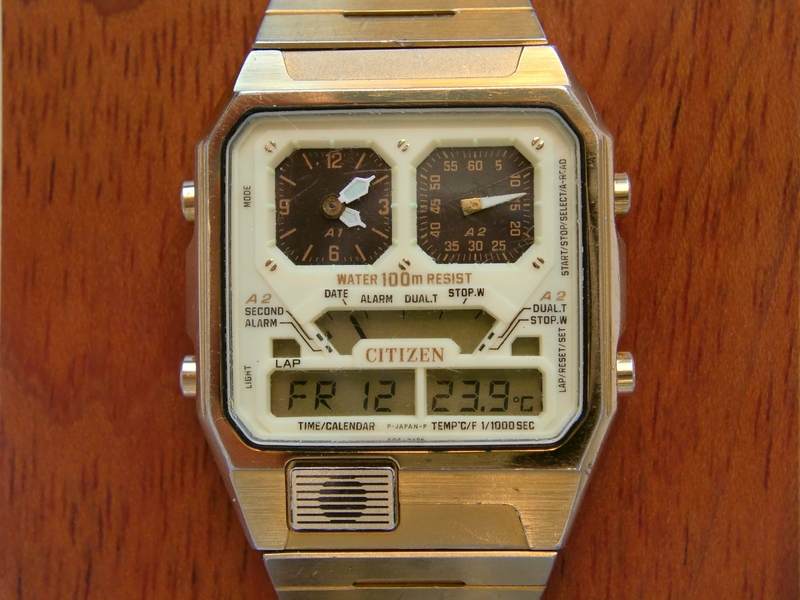 Regardless of what now A2 ( the Second Analog Watch ) shows – shows SECONDS, shows ALARM or shows DUAL TIME ? 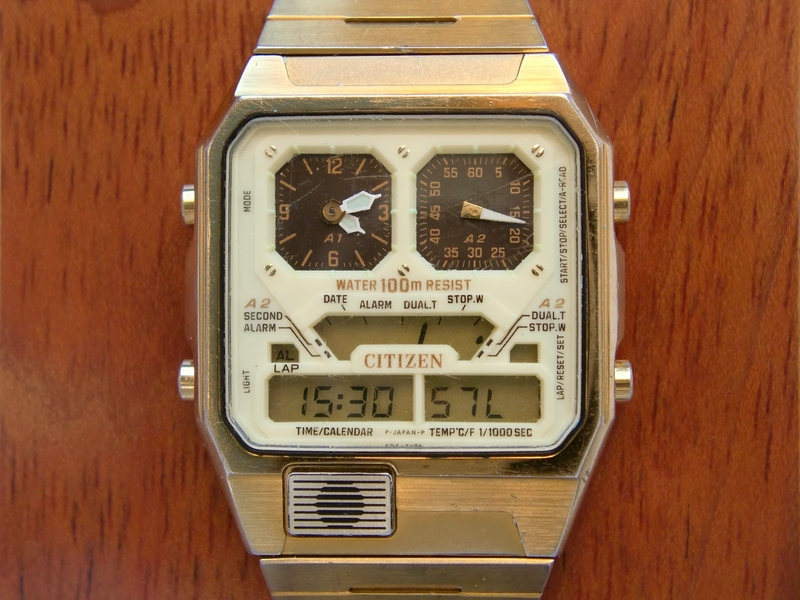 ” By pressing the „S” button, we can freely change it – more on How to use Analog Modes ” - Now by pressing „M” button and entering into the Digital Stopwatch Mode – The Analog Tip A2 also immediately moves at 12H (00) Hour mark !!! and also automatically enters the STOP.W mode !! !…pictured below…* This is the only case when DIGITAL and ANALOG Modes are associated !!! 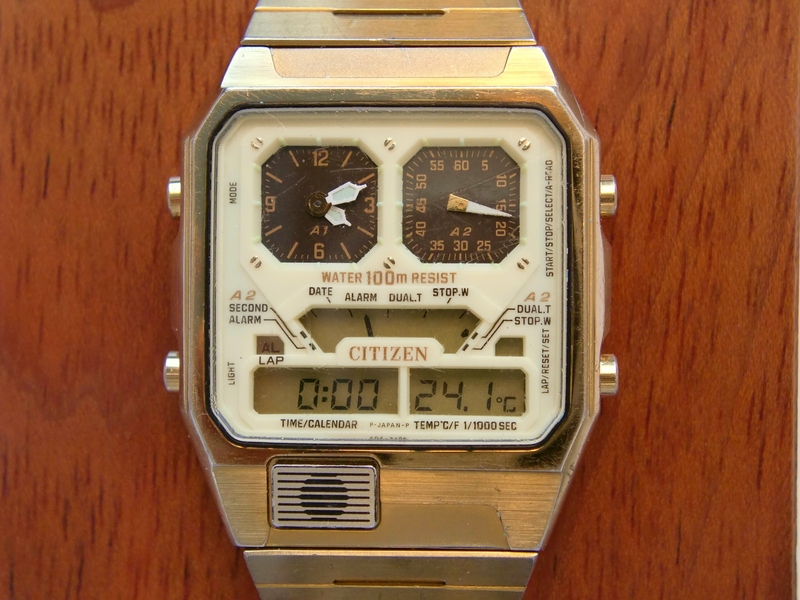 Now in addition to the digital stopwatch ( LCD Display – Minutes : Seconds : 1/1000 sec ) – Tip Second Analog Watch will show The Extra Countdown Time – or more precisely counted Hours ! 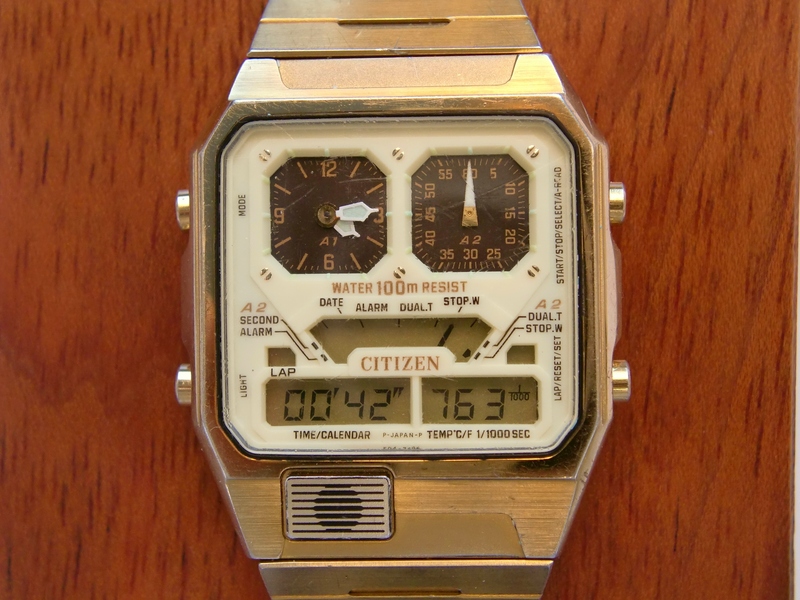 * You may have noticed that the average watch, measured with an accuracy 1/100s up to 60 minutes. Then follows a reload. 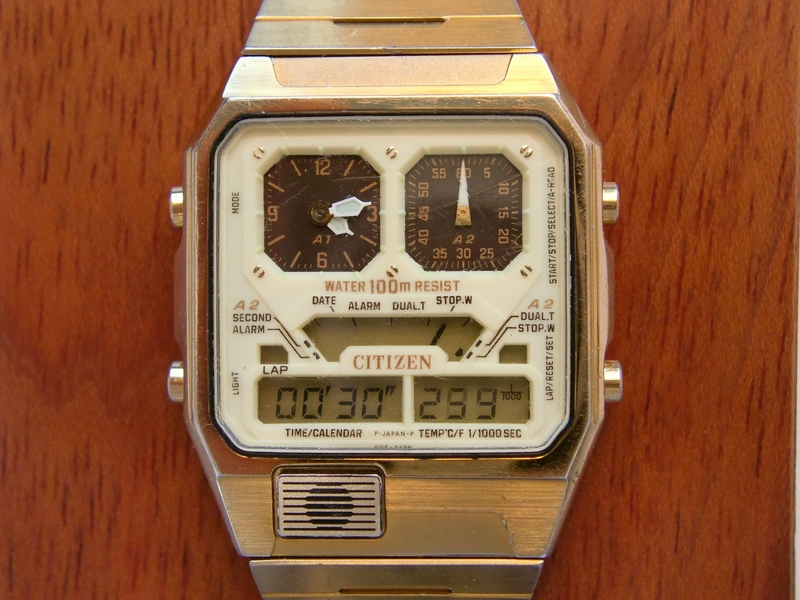 This watch is measured without reloading with an accuracy 1/1000s up to 12 hours ! ( Which gives 120 times wider range of measuring ). 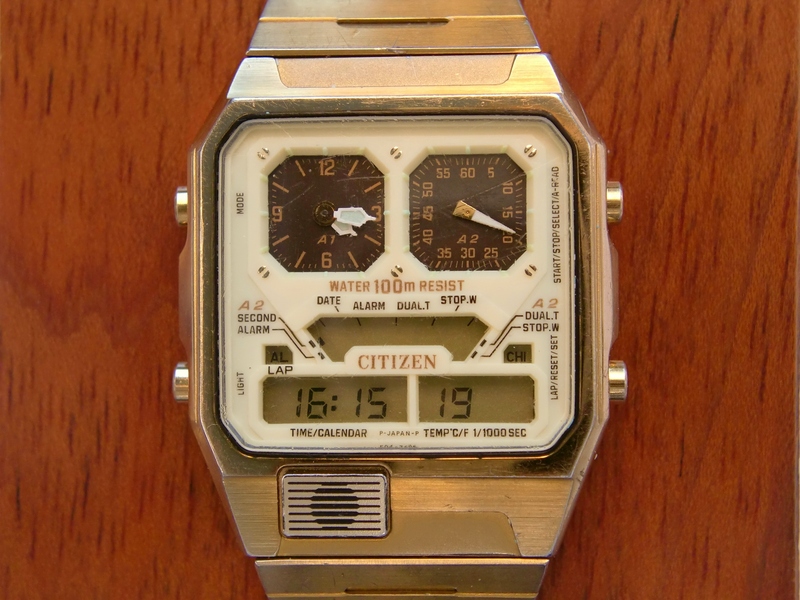 Now the Digital Display shows ( from right ) - 1/1000 sec – seconds – minutes – and (A2) 2nd Analog watch shows stopwatch hours ! Stopwatch – start by pushing „S” button. Stopwatch – stop by pushing again „S” button. Stopwatch - reset by pushing „R” button. Chime ON/OFF – by pushing simultaneosly „R” and „S” button . * But before you need to enter into the Normal Time Mode ! Look – on the right side „CHI” sign appeared ! Thank You !!!! 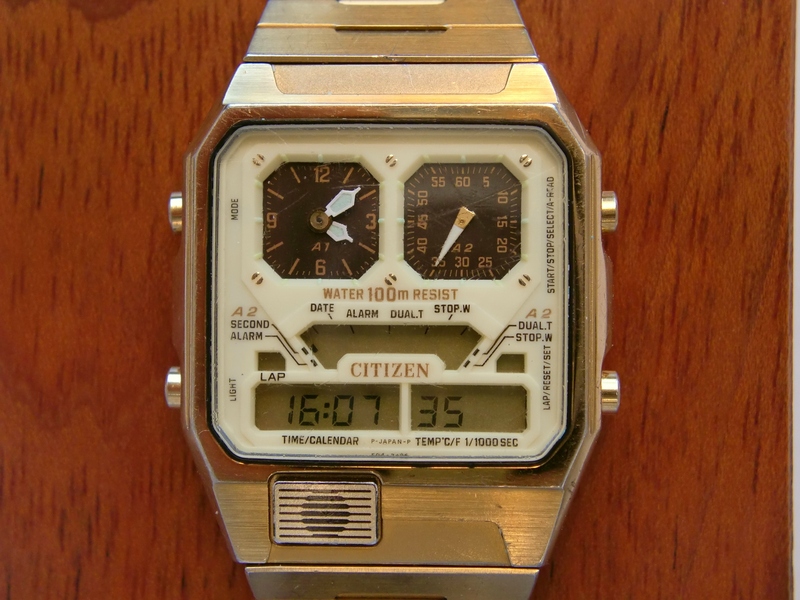 Its my favorit watches , my father present in 1982-1983 , my box is silver, and have instruction manual , but your information visually and clearly ! I’m glad that I helped you and you have this unique watch ! 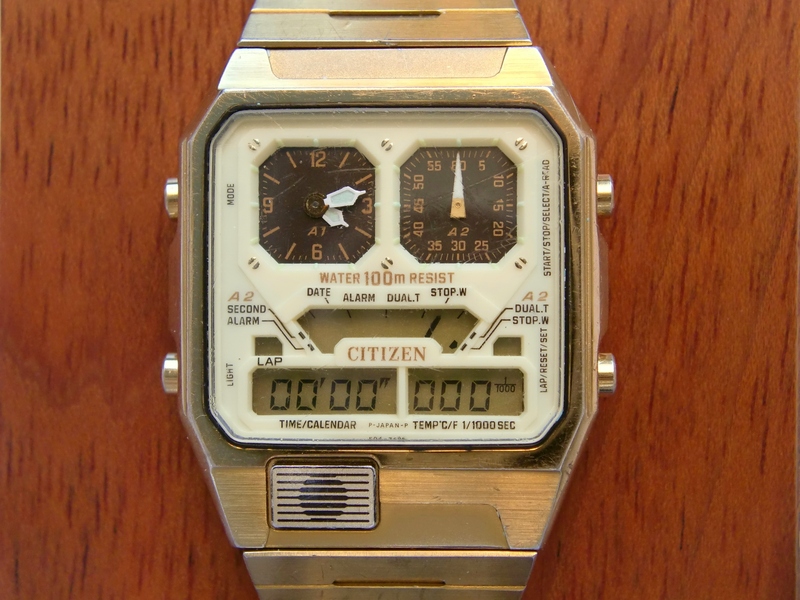 Your watch has an interesting history. I wish you to enjoy your watch for the next 30 years…Welcome to the Connoisseurs Club ! Are you able to information us for your website owner or man who looks after your blog post, I would like to determine it will be easy to be a guests poster. 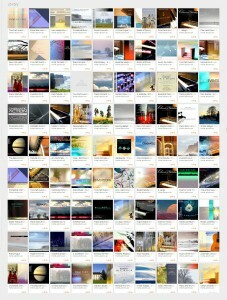 for me, keep up posting these articlpes or reviews.